Gold ring from Isopata. Gold signet ring found in a tomb at Isopata, in the vicinity of Knossos. 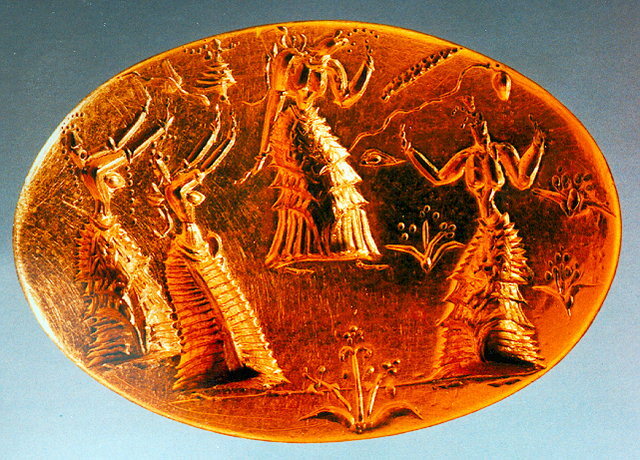 On the bezel is a representation of women in ecstatic ritual dance, in a meadow with lilies. The smaller figure is considered to be a goddess descending from the sky. On the ground, the signs of an eye and snakes can also be seen. It is a true masterpiece of Minoan goldwork, dated to the LM II period (15th century B.C.). Inv.no. X 424.